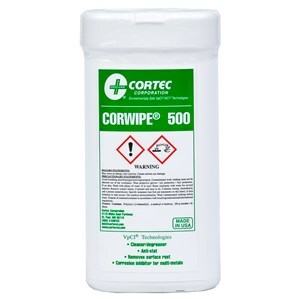 Corwipe 500 is a revolutionary wipe which removes light rust, grease, oil and dust, while leaving behind a protective antistatic and thin VpCI (Vapor phase Corrosion Inhibitor) film. The static dissipative film will drain charges when properly grounded, and reduce triboelectric voltage to less than 300 volts. Corwipe 500 is designed for both industrial and commercial cleaning applications. This product cleans machinery, equipment, tools, hoods, parts inprocess, office equipment, etc. Corwipe 500 contains active water based material that is safe to handle, is not harmful to skin and is classified as nonhazardous. In addition to its cleaning and antistatic properties, it leaves a thin film of corrosion inhibitors on the treated surface to protect most metal surfaces against corrosion. The Corwipe 500 features a 5” x 5” (12.7 x 12.7 cm) non-woven fabric towel, which is difficult to rip, even with the toughest of cleaning applications. Wipes are packed 25 to a flip top oval HDPE Towlette container. Computer monitors and keyboards, TV screens, CD players, equalizers, stereo speakers, etc. Lift tab to open. Remove a wipe and rub it over the affected part or area until clean. Wipe may be effective for more than one use depending on amount of contamination. Reseal to prevent wipes from drying. Leaves an indiscernible temporary protective film behind, providing anti-corrosion protection for up to several weeks. Also cleans rubber, synthetic materials, vinyl, painted surfaces, plexiglass and glass. Triple-action performance: cleans, provides antistatic protection and inhibits further corrosion. *Length of protection varies upon conditions, average 3-4 months.